Sunday Sunny Sunday at TCMF! 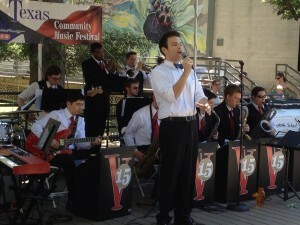 The Vintage 15 perform big band jazz and swing on Day 2 of the 2012 Texas Community Music Festival. Austin — The Seventh Annual Texas Community Music Festival continued Sunday to large audiences, who saw a variable cornucopia of musical styles, including performances from a number of TCMF rookies! The crowd, including a number of music lovers who’d traveled from as far away as Houston, were then treated to another first-time participant, Vintage 15, who blew the audience away with their tight jazz, swing and big band program. The ACC Jazz club sextet followed, after which more “newbies” took the stage: The Inside Out Steelband created a wall of sound that came straight from the Caribbean and then Bamako Airlines kept the groove going with their African-Pop set, including songs in various African languages and dialects. The evening culminated with the Austin Jazz Orchestra, making its second appearance at TCMF. The festival continues Monday at 5:30 at Central Market and continues through Thursday May 3. Check the schedule page for details on performance times and performers. TCMF is hosted by Central Market and the Austin Civic Wind Ensemble and sponsored by H-E-B and Strait Music Company. The band in the picture, the Vintage 15, was so incredible! They literally blew my friends and I away. Both singers were superb and the band sounded really tight. It was very cool to see such a good-looking group play all the old standards in a modern, fun way.